It’s a vegetable cleaver, which is exactly what I needed. We’ve been using the Eversharp series of Henckels since we moved, which aren’t completely awful, but it was a $49 set of knives, so you can’t expect too much from them. 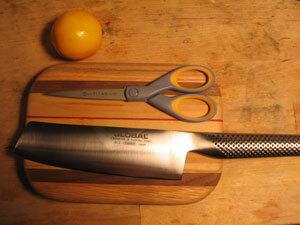 The finely serrated edge has a tendency to shred vegetables, especially zucchini. Not so my new cleaver. It met an onion on its maiden voyage, and the onion was cut. We all should have celebrated pre-Christmas together! So fun! you like the global? it always felt funny in my hand… but yay for you. 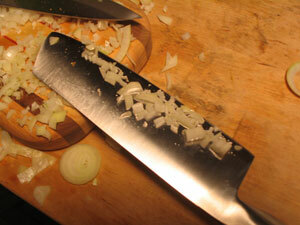 a knife you love is so insanely key!